You Are Here: Home » What is Deep-Sea Fishing? As coastal and open-water pelagic fisheries have become ever more heavily exploited and depleted, industrial fishing vessels have increasingly turned to exploiting deep-sea species. The primary method of deep-sea fishing is bottom trawling, which is among the most destructive. Today’s trawlers are capable of fishing seamounts, deep-sea canyons and rough seafloor – areas that were once avoided for fear of damaging nets. To capture one or two target commercial species, deep-sea bottom trawl fishing vessels drag huge nets armed with steel plates and heavy rollers across the seabed, pulverizing everything in their path. The mouth of the bottom trawl net is held open by two steel-plate doors that help keep the net on the seafloor. One company markets what it calls “Canyonbusters” – trawl doors that weigh up to five tons each and that undoubtedly live up to their name. To allow the net to fish on rugged seafloors, steel balls or rubber bobbins – known as roller gear or “rockhoppers” – are attached to a heavy cable that is strung across the bottom of the mouth of the net. In addition, heavy chafing gear is attached to the rear of the trawl net to further protect the net from being torn as it fills with fish and drags along the bottom of the ocean. In order to catch a few “target” fish species of commercial value, biologically rich and diverse deep-sea ecosystems such as seamounts are plowed through, often crushing corals, sponges and other benthic structures and lifeforms as they go. 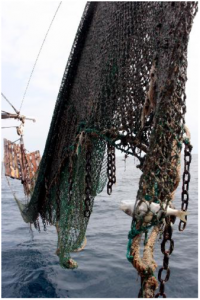 Many other species of unwanted fish are caught as “bycatch” and thrown, dead, back into the ocean. In a matter of a few weeks or months, bottom trawl fishing can destroy what took nature many thousands of years to create.